UN regulations (including ADR, IATA and IMDG) stipulate that all dangerous goods must be clearly identified. Diamonds (other than those of class 7 radioactive status) and the insert of any text (other than UN class number) below the symbol is to be confined to particulars indicating the nature of the risk and precautions to be followed during handling of them. Text to signify the nature of the risk is optional. A flammable substance is any element (gas, liquid, solid) which ignites more easily than other materials. 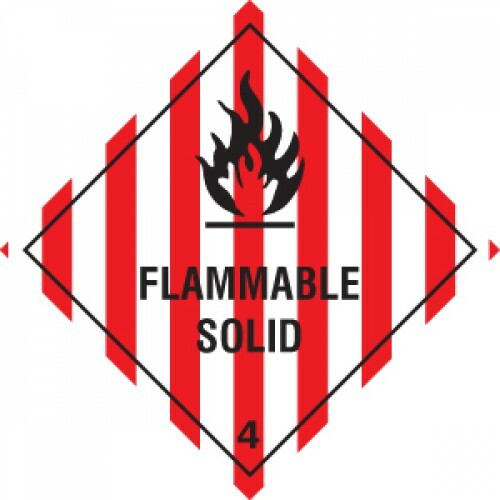 Flammable substances include, but are not limited to: Petrol, Diesel, Ethanol, Methanol, Aceto..
UN regulations (including ADR, IATA and IMDG) stipulate that all dangerous goods must be clearly identified. Diamonds (other than those of class 7 radioactive status) and the insert of any text (other..